"We have more possibilities available in each moment than we realize." Each day, two white boards in a peer-tutoring space at the rural community college where I teach, record students' hopes and fears. In reading these boards, you learn a lot, especially about students’ fears. Nowadays some, indeed, are afraid. “Will ICE be knocking on my door today,” wrote an anonymous someone a few weeks ago. Those words sat beside another’s fear that they hadn’t left enough time to finish an essay. “I’m so hungry,” wrote somebody else. Seeing fears written in a public but mostly anonymous way somehow makes them more visceral, something I wanted to capture in this post. But I also wanted to document the ways in which the space and the people in it have made hope more tangible too. One day not long ago, just outside my office door, a young man and woman reflected on a book they were reading for one of their English classes. These Chicano and Mexican American students named all the ways they related to Roxane Gay’s BadFeminist, expressing surprise and delight that a book written by an Haitian American academic told part of their own story as well. A second young man joined the discussion and together the three talked about masculinity’s challenges and traps and the need to open to the feminine and the feminine within the divine, something they felt connected them to their indigenous ancestors. Only a few feet away, the newly organized Literary Society club meeting was underway. From across the room, I could hear laughter and sensed the joy it contained as the group made plans for a new student journal. This club had been inactive for about ten years, so it was quite a feat that suddenly more than a dozen people were willing to come together and spearhead a project with so much potential meaning on our campus. 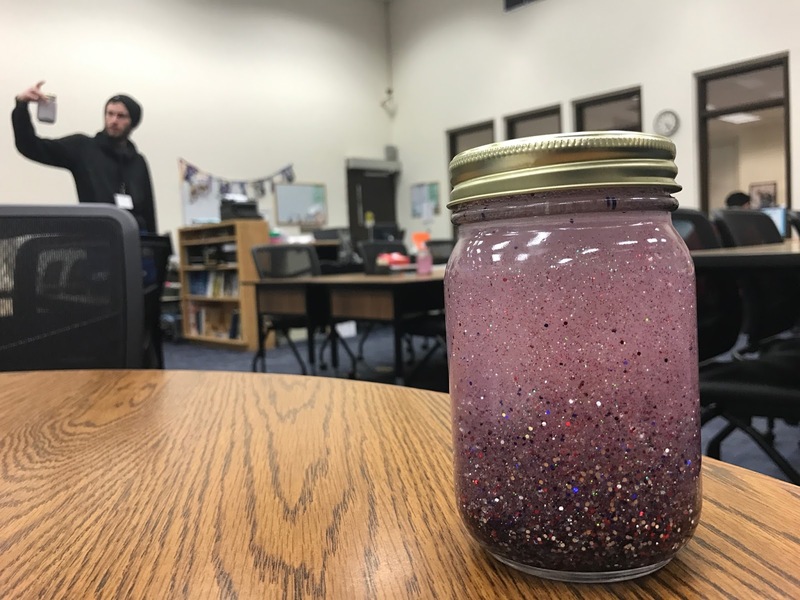 Only a few minutes later, a young man––an international student, perhaps the only one with this formal designation on our campus––came to my door expressing interest in the glitter jars that decorate tables about the room. They are like homemade snow globes and are there whenever anxiety or a need for delight overtakes someone––lift, shake, watch the glitter settle, and feel a bit more settled yourself. Like many schools, our college has developed this international program to collect big student fees. We imagine our campus populated by foreigners, foreigners with pockets deep enough to save us from whatever looming financial crisis may be on the horizon. But it’s hard to imagine why any one rich enough to fly to the US would choose this tiny underfunded campus when close by are larger cities with the kind of well-funded colleges one sees on television programs America exports overseas. Nevertheless, this young man chose us, and he is far from home in every way. The jars help him, he said, whenever he feels distressed. It was a pleasure to receive his gratitude as the jars mean a great deal to me too. I encouraged him to watch the short film Just Breathe (available on youtube) to learn more about the jars' origins and purpose without telling him I tear up every time I screen it for myself. He smiled and made a suggestion. You should have bowls of fruits too, he said, and nuts, on the tables to feed hungry students and the smell of the fruit the textures and so on, it would excite the senses and help people with their writing. Yes, I thought, what that would be a beautiful thing to do. Early that morning I’d gone for a run, a practice returned to my life after a two-decades absence, and now, suddenly, seemingly out of nowhere, I can’t get enough of it. I could run for hours, it feels, all around the town. Lately, there is the scent of the sea even up in the old neighborhoods, and at this time of year blooming cherries. Peregrine falcons fly high overhead, and old women walk by with dogs who sniff my ankles. I rub the dogs’ heads and say good morning to the ladies knowing one day I will be old because we only ever go one direction. The memories of these runs sometimes come with me to school, and I feel the blood pumping through my body as I look out at the students working away on their essays or talking with friends, and there is purpose in their focus. They are at it. They are here. I think, yes, there are things to fear in the world right now and so many reasons to hope.